Making wine and educating the underserved are intertwined themes in the Christian Brothers story. For many years the Brothers helped to support schools along the West Coast with profits from the sale of their wines. It’s not surprising that alumnus Kelly Trevethan ’85, who has deep roots both in winemaking and Lasallian education, has followed in their footsteps. Trevethan attributes his interest in wine to his grandfather, a winemaker who came to California from Italy and worked in the Concannon and Wente wineries in the Livermore Valley. Trevethan remembers watching his grandfather making wine at home. “I must have been bitten by the bug way back then, but I didn’t realize it until I was older,” he said. 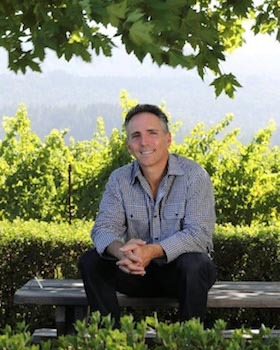 After building a successful career in wealth management, Trevethan became a partner in Alpha Omega, a winery in Rutherford in the Napa Valley. While serving on the Board of Trustees of his high school alma mater, De La Salle High School in Concord, he wanted to find a way to help the school support the education of students from economically distressed families. That’s when it occurred to him. Why not create a virtual winery with a quality product using donated materials and put all the proceeds into scholarships? The Beckstoffer family, one of the largest vineyard owners in the Napa Valley, Francis Ford Coppola, The Trefethen Family Vineyards, Grgich Hills Estate, Spottswoode, Kendall Jackson, Flora Springs, the Antinori family and others donate all the materials and services needed to produce bottles of wine. So far, Speratus has raised more than a quarter-million dollars, providing scholarships for students at three participating Lasallian schools: De La Salle in Concord, Justin Siena in Napa and Sacred Heart Cathedral Prep in San Francisco. You can support this new endeavor by purchasing Speratus Wines at speratuswinery.com.